History drips from the Outer Banks: Here, aviators Orville and Wilbur Wright took their famous first flight (at Kill Devil Hills), the pirate Blackbeard fought his last battle (at Ocracoke) and the mysterious Lost Colony disappeared (where is anyone’s guess). 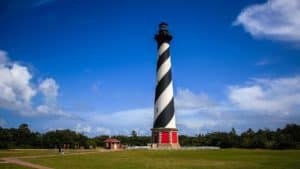 But this chain of barrier islands off the coast of North Carolina – affectionately dubbed OBX – isn’t just for history buffs. Fishing, windsurfing and wildlife watching attract adventurous types, not to mention the 3,000 shipwrecks you can explore by scuba diving. Families gravitate toward the beaches, mini-golf courses and the North Carolina Aquarium at Roanoke Island. 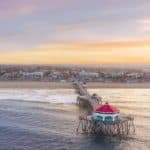 Each island has its own charm: The old lighthouses, rugged dunes and secluded beaches in the south couple with vacation rentals, water sports and kitschy beach shops, such as the Stop-N-Shop Beach Shop, in the north, all to form a unique seaside destination. If you come to the Outer Banks expecting action, you’ll be disappointed. OBX is ideal for those looking to skip the overly touristy attractions and head straight for the unspoiled beaches. You won’t find big nightlife, but you will find an abundance of natural beauty. Beaches are more populated during the summer months, but with so many destinations spread out along the barrier islands, you likely won’t experience big crowds. 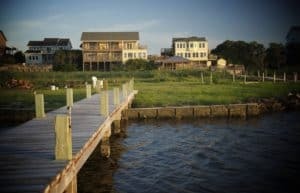 Vacation to the Outer Banks, continue reading our Outer Banks Travel Guide and plan your vacation here. For more beautiful East Coast Beaches, visit here. Most locals and out-of-towners arrive during the summer months when the temperatures are the warmest. But the best times to visit the Outer Banks are from March to May or September to November, when rates drop and crowds dissipate. Similar to other parts of the Southeast, the temperatures stay relatively warm and humid – with average highs hitting the upper 80s in the summer – until the winter months, when the weather dips into the 40s and 50s. Keep in mind that during the offseason some attractions, as well as restaurants and shops, may close or operate under more limited hours. Sunglasses and hats offer much-needed sunscreen and flip flops are perfect for navigating hot, sandy beaches. Go pack them now so you’re not kicking yourself later. What about those little items that make beach visits so much more enjoyable? For a little extra comfort on your trip, make sure you pack: Lip balm, sunscreen, bug spray. Beach toys and goggles are a must for kids. Building sandcastles and viewing the underwater wonders are perennial favorites. Take a first-aid kit with you. Hopefully you’ll only have to worry about a few minor scrapes from seashells, but having your own kit handy is a good precaution. Beach Bag – Your beach bag will likely contain a few of the items mentioned above. For a well-rounded bag, consider tossing in sunscreen, lip balm, bug spray, first-aid kit and water-proof baggies. 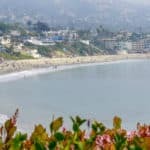 Beach Gear – No matter who’s supplying the gear, look to have the following items on hand: beach bag, beach chairs, beach towels, beach umbrella or tent, beach cart and a cooler. Remember: Don’t wait until you’re parched to drink. When you’re out in the heat and sun, it’s important to stay hydrated by drinking regularly. So take along a water bottle as well. The most recognized symbol of the Outer Banks is certainly the black and white candy striped lighthouse in Buxton. The Cape Hatteras Lighthouse is the same height as a 12-story building and is the tallest lighthouse in the United States! For 2009, the lighthouse is open to visitors from April 17th – October 12th. You may climb to the top, but be forewarned – it’s not an easy journey! Be prepared to climb up 248 iron steps with no air conditioning. However, the view from the top is so worth the effort! 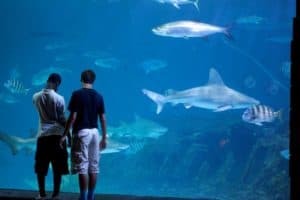 While the otters tend to steal the show, the aquarium also offers a touch tank, a shark exhibit, gift shop, and programs for kids. Special programs include dive shows, live animal encounters, and animal feeding activities. The Roanoke Island Aquarium is open 9:00-5:00 daily, and tickets are $8 and less. No trip to Nags Head is complete without climbing to the top of Jockey’s Ridge! Located in Nags Head at Mile Post 12, it is the tallest natural sand dune system on the east coast. The fragile system of dunes constantly changes in response to the wind and weather. Visitors will find a 1.5 mile self-guided trail, a 360 foot boardwalk, and a 1 mile soundside nature trail. You’ll see many families flying colorful kites, and kids having fun rolling down the dunes. Located on historic Roanoke Island, these breathtaking gardens offer flowers, shrubs, and trees. Marvel at ancient live oaks, smell the herb garden, and delight in the endless array of blooms. The Elizabethan Gardens are open 7 days a week, year-round. You simply can’t talk about Outer Banks history without mentioning Orville and Wilbur Wright’s famous 1903 flight. 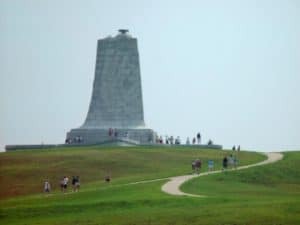 Visit the exhibits, including a replica of the Wright’s “flying machine.” Be sure to climb Kill Devil Hill where the 60 foot pylon stands – you’ll find stunning views of both the ocean and sound from the top. 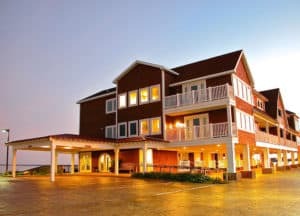 The Inn on Pamlico Sound is a full service boutique hotel offering world class waterfront accommodations, fine dining, event hosting and gourmet catering on North Carolina’s Outer Banks. The three acre facility sits on a ridge between the banks of the Pamlico Sound, one of North America’s largest estuaries, and the Buxton Woods coastal preserve, one of North America’s largest maritime forests. For more information, pricing, or to reserve your room visit The Inn on Pamlico Sound. Located on the beautiful Roanoke Sound, they are the only boutique hotel in Nags Head. Their 17-suite hotel was designed and decorated to offer all the comforts and amenities of home. Here you will find Honeymoon, Executive, Family and Handicap Accessible suites. Each suite offers a full kitchen, jet spa-inspired tub with a separate shower, a private master bedroom, a private balcony and beautifully appointed furnishings. For more information, pricing, or to reserve your room visit the Oasis Suites Hotel. 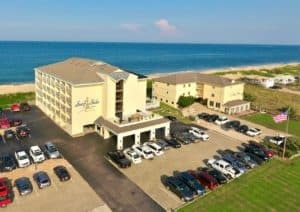 This Outer Banks hotel offers oceanfront and ocean view hotel rooms where guests can relax and enjoy the sunrise over the water. A variety of accommodations are available, including efficiency rooms, loft rooms, double queen and single king bed rooms, and full honeymoon suits. In addition to the gorgeous view, they also offer a great selection of amenities to their guests, including hot tubs, indoor and outdoor pools, private balconies and a free continental breakfast. For more information, pricing, or to reserve your room visit the Surf Side Hotel. Make yourself at home in one of the 180 air-conditioned rooms featuring refrigerators and microwaves. Grab a bite to eat at the hotel’s restaurant, which features a bar, or stay in and take advantage of room service (during limited hours). Quench your thirst with your favorite drink at a bar/lounge. Buffet breakfasts are available daily. Enjoy a range of recreational amenities, including an indoor pool, a spa tub, and a fitness center. Additional amenities at this hotel include complimentary wireless Internet access, an arcade/game room, and wedding services. For more information, pricing, or to reserve your room visit the Hilton Garden Inn Outer Banks. 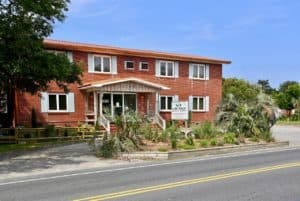 With a stay at Cape Pines Motel, you’ll be centrally located in Buxton, steps from Cape Hatteras National Seashore and within a 5-minute drive of Cape Hatteras Lighthouse. This motel is 1.2 mi from Buxton Woods Nature Trail and 3.5 mi from Frisco Mini Golf and Go Karts. Take advantage of recreation opportunities such as an outdoor pool, or other amenities including complimentary wireless Internet access and a picnic area. Additional amenities at this motel include barbecue grills and a vending machine. For more information, pricing, or to reserve your room visit the Cape Pines Motel. Wow cool. Nice write up here about the outer banks and its environment. I feel like I have just walked thru the area myself! But now I am packing my bags….well seriously I am planning a trip to the Outer Banks. I have a friend who has vacationed here and he said it was an amazing place. I can see by your post that it is. You have provided everything I need! Thank you! You are very welcome, and yes it is an amazing place. A lot to explore and discover that is for sure. Thanks for visiting beach travel destinations. Helpful guide! I love the Outer Banks! It’s just a place of relaxing and full of fun. I have been there, and my favorite thing to do is just walk along the coast. So beautiful and serene. Now I see there is so much more that I have missed. I am looking forward to revisiting the Outer Banks. Now I have all the information I need to make it an even better vacation. Thank you! You know first hand then all about the area. I am glad my Outer Banks Travel Guide gave you some additional information for your next vacation here. Please let me know if you need anything else. I would be glad to help! Great travel guide and wonderful writeup. 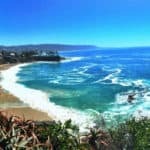 This guide is perfectly written to increase my passion about travelling to beach sides and islands. I love scuba diving and the fact that there is one with 3000 shipwrecks makes the location perfect for me, other locations are wonderful too, if only I could travel them all. Great work sharing these. Thank you ! I am glad you enjoyed my Outer Banks Travel Guide. Besides the beach (which was quiet where we were), we absolutely loved going to Jockney’s Ridge! The kids brought their boogie boards and slid down the hills. I had quite a good workout climbing up those dunes! lol It was lots of fun though. I can’t wait to go back to the Outer Banks! Oh I bet you had a work out climbing the dunes! Never did do the boogie boards down that, how fun! Thanks for visiting my Outer Banks Travel Guide and taking the time to leave me comments! Last year we went to Myrtle Beach but this year I want to go to the Outer Banks as I have never been there. I love the ocean of course, but I also get excited to check out the sites. When we go on vacation we love to check out the local microbrews. Off The Wall Tap House looks like it would be a fun place to go. Are there any good microbrews that you could recommend? Hi Wendy, as far as micro brews it really depends what you like. If you like a good Ale, try Weepin Radish Farm Brewery. I like hefeweizen, so I stick with Lonerider, or a good IPA choice is high-wire brewing. They, of course, have many others to choose from 🙂 You will enjoy! Must say the drone view of Outer Banks, is amazingly beautiful! You are very welcome. I am glad you enjoyed my Outer Banks Travel Guide. Thanks for stopping by! I have been wanting to visit the Outer Banks for quite some time now. I just started doing a little research for hotels and pricing and such. Great information here! You have basically everything that I need from hotels, to restaurants and things to do. Loved the video! Thank you so much – this has helped immensely! Glad I could help and that my Outer Banks travel guide provided you with all the information you need for your Outer Banks vacation. Thanks for stopping by! I have read the beautiful blog about the Outer banks and left you a comment there. I loved the topic as I am visiting places around the world and never been to the US yet. It’s one of the subjects I personally love, and I’ll make sure to remember the Outer Banks. Last year I have chosen Montenegro on the Adriatic Sea and have visited Budva city in particular. My choice was because I have heard about its beautiful beaches. Beaches are what I choose all the time as I love the sea and the sun most above anything else. Great ! You will love the U.S. beaches! Please let me know if you need any additional information. I have always wanted to visit but did not know how to go about it. Now I know what to do, I know when to visit, I can work on my budget and still have great fun. I know the outer banks will be fun but do you think a budget of $10,000 will be enough to have a great time there? Hi Linus! Oh my gosh, $10,000 is a HUGE budget for the Outer Banks! You really don’t need that big of a budget. I guess it depended on how long you stay LOL. You will have a marvelous time! My company is based in the Raleigh area and I often travel there for work. 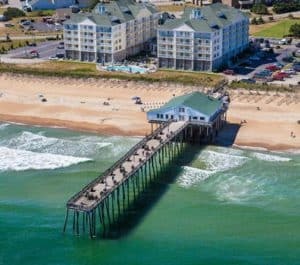 I’ve heard wonderful things about the Outer Banks (which you’ve confirmed thoroughly), but was curious if it is worthwhile to be driving from Raleigh or if there is a better way to get there. I also grew up in the Michigan area and every Friday the trip from the lower half of Michigan to the upper half of Michigan was an absolute traffic jam and nightmare. Does the same happen from the west to east side of the state? Basically, should I be leaving Thursday night if I can to avoid a permanent traffic jam? Yes, I would recommend leaving Thursday night. Really depends on when you go though. If you go during the busy time of year (summer) then, absolutely leave a little early just in case you do hit traffic. I’ve only driven from Florida up. I’m really glad I read your post here and get to know all about the beautiful Outer Banks. It’s the first time I hear of it and Ive never been to the US before. I love traveling myself and I make sure to visit a new destination every year. I’ve been to so many beautiful beaches around the world, and this seems to be a must visit place. It is a must visit place Joy! I hope you can make it here soon and take in all the Outer Banks has to offer! Kill Devil Grill is a favorite of mine, and you’re absolutely right, the specials board wipes out early! However they do have some reliable staples such as the cheesesteak egg rolls. One other suggestion would be Food Dudes. Tiny place that sits in a strip mall but possibly the best and most innovative food I’ve had anywhere in OBX. Thanks for the review, I’ll be heading there again this summer and definitely need to check out Coastal Provisions! Wow Jon, I envy you. Although it is really not far for me to drive, so this might be a great trip for us this summer as well. We will try the Food Dudes! Thanks for the tip! Thanks again for your wonderful site! I know this is for travel but this information for me is extra valuable. My husband and I have been talking about moving to North Carolina, (we are in Boston, MA now) because of it’s beautiful landscapes and the lower cost of living, but it would also be nice to have things to do when we are there. 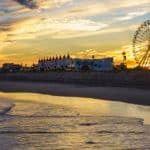 I really like this post, just looking at the pictures you have here lessen my anxiety of moving to a new state and I will have to be sure to visit Outer Banks once I am there. Great post! You will most definitely have to visit the Outer Banks. There really is something for everyone, not just gorgeous beaches. Thanks for stopping by! I love how you give pretty much everything on one page. I usually have to research and visit several pages to find out everything on a place to visit! Thank you so much. As a history teacher AND a lover of the outdoors, Outer Banks is on my travel list! Great Alexis! I am glad you enjoyed reading and now added the Outer Banks to your travel guide. Thanks for visiting beach travel destinations. I love the Outer Banks! It’s so peaceful and relaxing. We usually stay at the Surf Side Hotel. Very nice place! Clean, comfortable, and nice staff. One thing we like to do is take the ferry over to Ocracoke Island. Ocracoke is one of the southernmost islands of the Outer Banks. It is such a beautiful island where you can ride around on bikes and visit the beach. We always find really nice shells there, especially sand dollars. You mentioned several things here in your article that I haven’t seen or visited yet. I’m very interested in the Wild Horse Adventure Tours. I’ve always wanted to do that. Thanks for providing the number where I can get more information about it. We will be sure to do that next time we visit! Wow, sounds like you love the area too! I know that since I have been in Florida, so many beautiful places on the east coast are just a stone throw away, compared to Texas where we used to live. Yes, lots of shells and sand dollars which are really not too hard to find! Thanks for stopping by and I am glad you found some new places to visit while vacationing to the Outer Banks! Awesome guide, I loved the reading! I’ve heard of Outer Banks from a few friends of mine. They went there on vacations and they really liked the place. Now that I read your article, I can understand the good time they had. I will definitely put the Outer Banks on my bucket list. I see there is safari excursion, that’s one of my dreams. 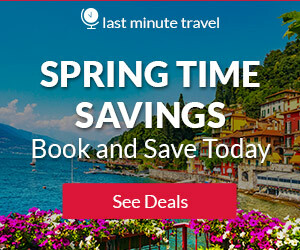 Do you know when we can get the best deals for traveling there? We are on a budget for the moment. March to May or September to November you will find that the rates drop. So this is the best time to stretch your vacation dollars farther. There is plenty of camping sites, for a great list of the camp sites in the Outer Banks, go to The Outer Banks Camping website. Let me know if you need any additional information. I had no knowledge of the Outer Banks and am keenly interested in exploring this beautiful part of the world. The Elizabethan gardens look so peaceful and lovely and the contrasting experience of the aquarium to Jockey’s ridge make it an appealing and dynamic destination. I will definitely put this on the list of a tentative place to jump to when I head out East to see my folks! Thank you for your continued content Leahrae! So many places to discover! Thank you Bex for visiting and taking the time to leave me comments as well as your continued support. Glad you enjoyed my outer Banks Travel Guide.